It might be time for an intervention. I planted another bed of garlic yesterday. It was a small bed, but just the same, I agreed to be done planting two weeks ago. My lunch is what got me into trouble. A quick meal of fusili tossed with the season’s final tray of roasted tomatoes, parmesan cheese, and a handful of garlic sautéed in butter. But it wasn’t just any garlic. It was a smooth Italian softneck that really shines as the star of simple pasta dishes. And for reasons I’m not at all certain of, I didn’t set much seed aside for my initial planting. Luckily I realized the error of my ways in the nick of time. I went out to the shed after lunch to rummage through our eating stock and found just enough plantable size cloves to put in a few rows. But that was it. No more. To distract myself from any further temptation, I devoted the rest of the afternoon to bringing in the last of the carrots, parsnips, potatoes, and beets. 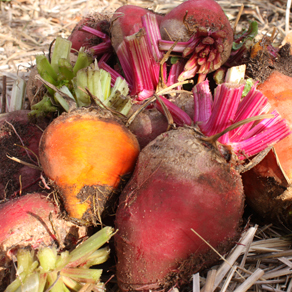 This is the time of year when choosing between which of the root vegetables to prepare is still new and exciting. Young love. I treasure it, because I know the burden I’ll feel come February when I have to hack into yet another winter squash. But when that stage hits, I’ll turn to my garlic to help pull me through. Nothing dresses up baked squash, mashed potatoes, or roasted beets better than some caramelized garlic squeezed over the top. I just put a handful of peeled cloves in a little foil packet with some salt, pepper, and olive oil drizzled over the top and let them roast alongside the chosen accomplice. It seems to make everything more bearable. Not that I wait around for the doldrums of winter to start roasting garlic, mind you. Fall officially kicks off around here with the first plate of roasted heads. The simplest method is to slowly roast whole heads in a 325º F oven until garlic is soft and aromatic – anywhere from forty five minutes to an hour depending on the garlic. The garlic will effortlessly squeeze out of its papers onto bread, pasta, crackers, baked potatoes and anything else you happen to have at the table. Prep for this is quick and easy – just thumb most of the outer papers off of whole heads, remove any dirt from the root end, and then use a sharp knife to trim the very tops of the bulbs off, leaving the tips of the cloves exposed. Put the heads in an appropriately sized oven proof dish with a lid (foil will do in a pinch), drizzle some good olive oil over the heads and sprinkle with coarse salt and pepper. It’s hard to go wrong. But sometimes I like to gussy it up a bit. 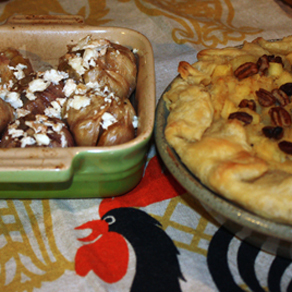 This is how I served tonight’s garlic, with a humble parsnip pie to accompany it. A glass of Sangiovese, some Tetzner’s cinnamon ice cream for dessert, and our good friend Jim to share it all with made it a November meal to be proud of. Clean most of the outer papers off of how ever many whole heads you’d like to bake and trim away any dirt from the root end. Use a sharp knife to trim the very tops of the bulbs off, leaving the tips of the cloves exposed. Put the heads in an appropriately sized oven proof dish with a lid and add a little broth and a splash of wine. You want enough liquid in the dish so the heads are about half covered. Dot each head with a small pat of butter, and sprinkle with coarse salt and pepper. With the lid on, bake the garlic in a 325º F oven. As the garlic roasts, periodically baste the garlic heads, spooning the broth into the center of each head. When the garlic is soft and aromatic (about a forty five minutes to an hour depending on the garlic) remove from the oven and crumble a handful of good bleu or feta cheese over the heads. Replace the lid and let it sit for about 5 minutes. Serve the garlic, broth and all, with plenty of good crusty bread. Be sure to soak up some of the luscious broth along with the garlic. This makes a great appetizer or side for any fall or winter meal. Any left over heads (yeah, right) can be refrigerated and added to soups or sauces for extra flavor. Jill: Think we need to talk soon about garlic (and/or intervention). I share the same love!